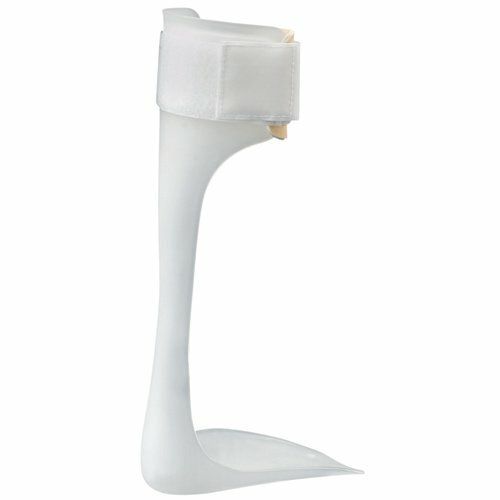 Ankle Foot Orthosis Support - Solid AFO Drop Foot Brace for Ankle Mobility Aid for Dorsiflexion Movement, Medical Aid for Men and Women AFO is designed to provide increased dorsiflexion assist and greater medial-lateral control during ambulation for those patients suffering from drop foot. The Ankle Foot Orthosis (AFO) splint provides static dorsiflexion assistance and lateral stability for the foot-ankle area. The Solid Ankle AFO is made of durable polypropylene plastic. The prefabricated AFO is available in all sizes that include a wide range of men and women's shoe sizes. The Solid Ankle AFO offers you the support you need with the convenience of prefabrication. Uses of AFO: AFO, is a support intended to control the position and motion of the ankle, compensate for weakness, or correct deformities. AFOs can be used to support weak limbs, or to position a limb with contracted muscles into a more normal position. Ankle foot orthosis control the foot drop caused by a variety of neurologic and musculoskeletal disorders.